Magnetite crystals have, as dominant forms, the octahedral and rhomb-dodecahedric habits. 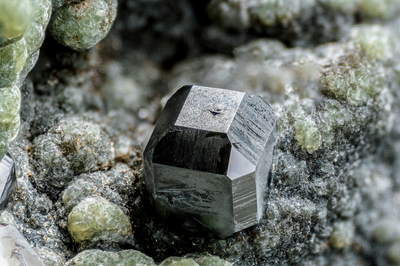 Magnetite crystals exhibiting the cube as a dominant form are infrequent. The crystal shown in the photo shows all three habits. Actually, it consists of three crystals, the smaller two of which have grown on the upper part and to the left of the largest crystal. On green lizardite spheres. Collection and photo of Gianfranco Ciccolini. Magnetite crystals have, as dominant forms, the octahedral dress and the rhomb-dodecahedric one. The crystals that present as a dominant form the cubic one are infrequent. The black and shiny crystal depicted in the photo exhibits all three habits: the rhomb-dodecahedric one has striations, the octahedral one is very shiny and the cubic one is rough. On green lizardite spheres. Collection and photo of Gianfranco Ciccolini.